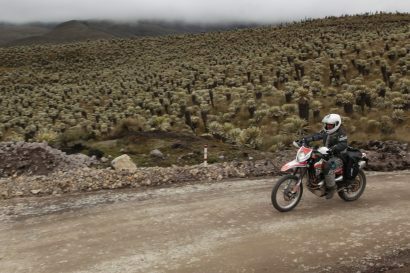 If you’re an adventure motorcycle rider, I don’t have to tell you how expensive good boots are. 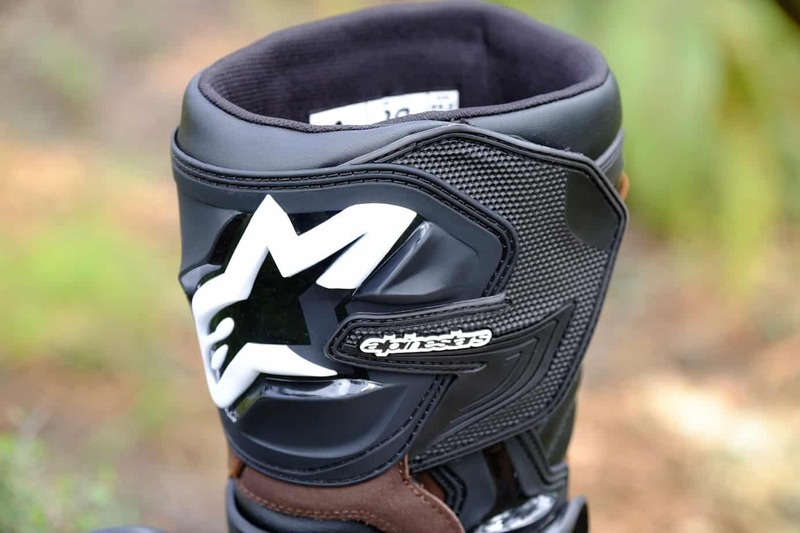 It’s not hard to burn $500, but Alpinestars has just released a model that might redefine the value proposition. It is the Corozal Adventure. Several years ago I tested their price point boot, the Scout. It was a nice product, nothing too fancy, and at the time seemed like one of the best values on the market at $280. 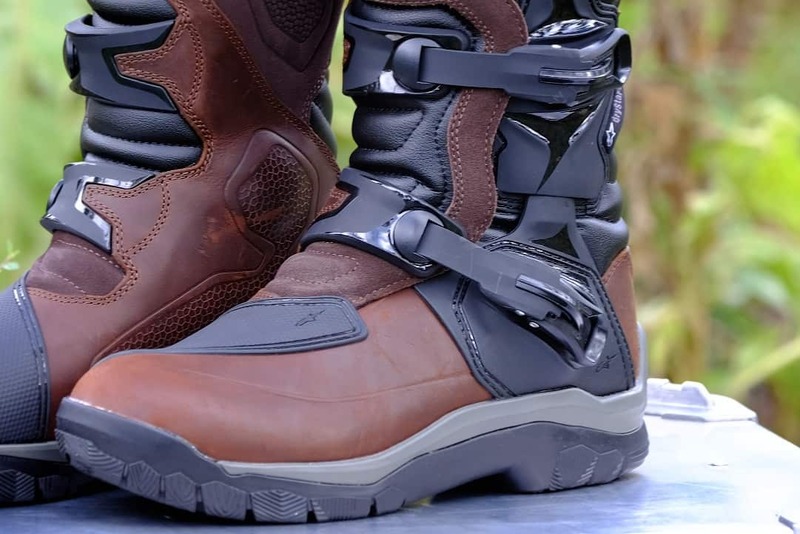 A couple of years later as part of our Overland Journal motorcycle boot review, we evaluated the Alpinestars Toucan Gore-Tex, a boot that we thought was simply superb. It also fetches a price commensurate with the quality at $500. The Corozal slips in at just under $300 but in many ways, gives the Toucan a run for the money. They sure look pretty when pulled from the box. I’ve learned to take the pictures first then put them through the wringer before I spill oil on them, scratch them to death, and otherwise abuse them. Although I only have a month in them, they’re pretty phenomenal for the money. For any money, actually. The oiled leather looks great and once broken in, feels great, too. Whereas the Toucan represents the pinnacle of protection and performance, the Corozal only dials those attributes back just a tad. Instead of all-metal buckles, the Corozal uses heavy duty polymer buckles, which frankly, are plenty durable. 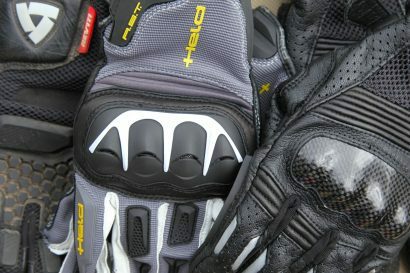 The Toucan uses Gore-Tex for waterproofing and the Corozal employs Alpinestars’ proprietary DRYSTAR membrane. 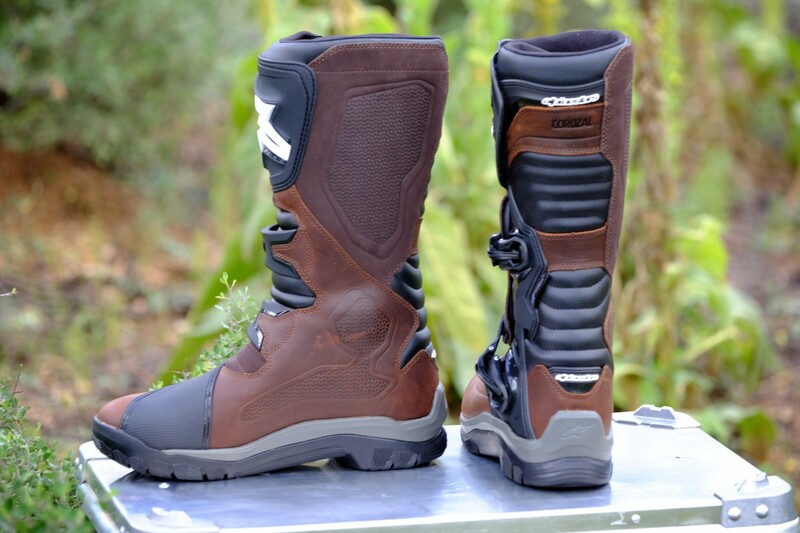 Instead of dual hinges at the ankle, the new boot has one mechanical pivot on the outer aspect of the shell. To keep the price in check, the Corozal skips the stitch down mid and outsole in lieu of a bonded package that actually provides some unique benefits. That mid and outsole system is built with a thick EVA mid layer which creates excellent vibration dampening and all day standing comfort. It has a walking quality that feels very much like a hiking boot and less like a motorcycle stomper. 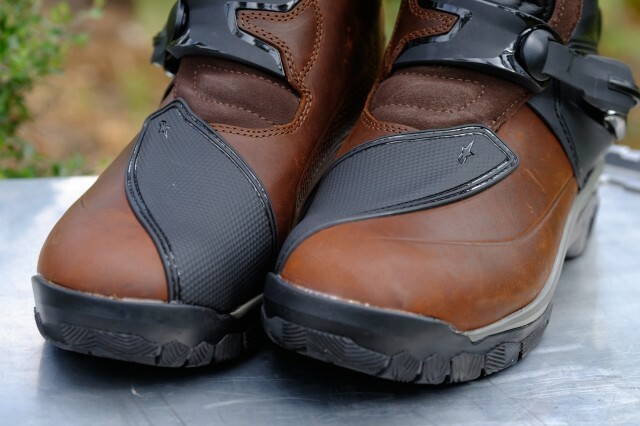 Below: The padded cuff is extremely comfortable and of nicer quality than boots double in price. The outsole package feels secure under foot, particularly at the mid-foot while on the pegs. Price point boots often look like price point boots. Not the Corozal. The detail in their construction punches high above their weight. The performance and comfort are equally top notch. The upper aspect of the Corozal is made of top grain leather with strategic placements of polyurethane to shield the leather for long ware life. Heavy TPU plating at key points protects the foot and lower leg. A soft bellows at the back of the boot and at the instep amplify flexibility and the self-cleaning buckles are easy to adjust, and in my opinion, are the best in the business. 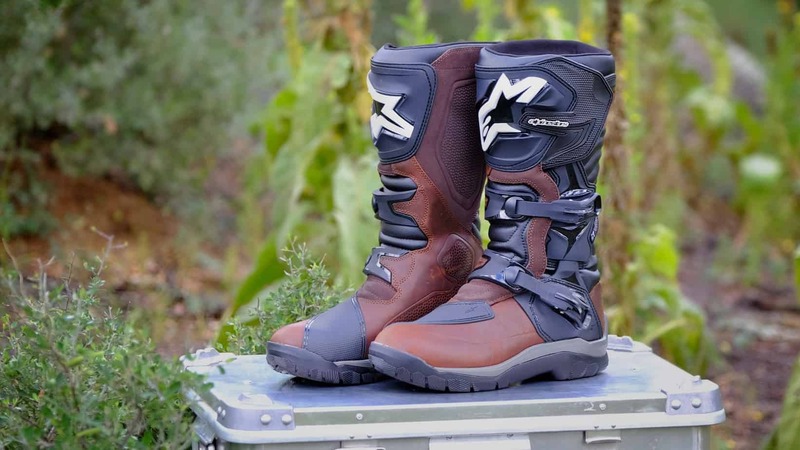 For people who want something that qualifies as an off-road boot, but without the excessive bulk and price those types of footwear often demand, the Corozal feels light and sleek without sacrificing protection. 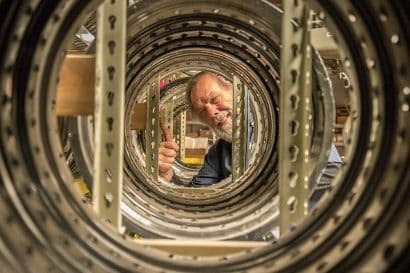 I’ve done enough boot reviews to know many of you want to know about weather proofing and breathability. To be very honest, all boots are hot. I can ride in a day long rainstorm or through 100 degree sunny weather and my feet come out of almost any boot feeling damp. 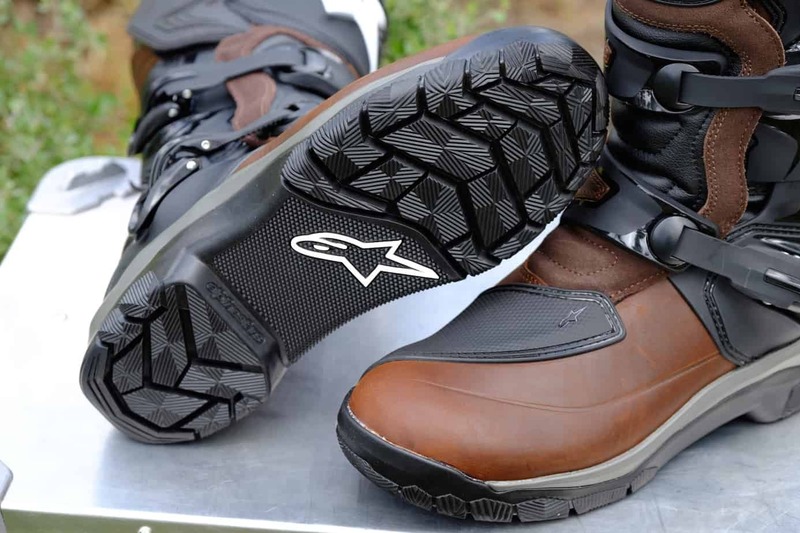 I will say, my feet don’t cook in the Corozal and although I’ve only used them in one minor rain storm, I assume they’ll be as waterproof as the other Alpinestars boots I’ve tested––extensively. It’s another nice option from Alpinestars and I look forward to spending more miles in them.